Alaska is unlike any other place in the country, perhaps the world. The days can stretch to extreme darkness or extreme light depending on the season. The vast open expanse of the terrain seems to bend and flow for unending miles capped with mountains nearly twice the size of those in Colorado. It is easy to understand how it became a modern day Wild West. 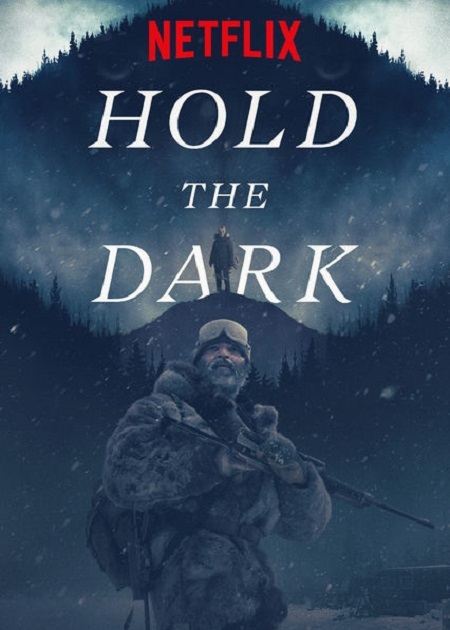 In Jeremy Saulnier’s newest film Hold the Dark, Alaska exists as a force that has been embedded within the psyche of all the characters. In the dead of winter, the cold has clenched their bodies and begun to fester a well of anger and hostility towards the outside world. Saulnier calcifies this sentiment over the length of the film to extract some of his most palpable set pieces to date. Yet, in the midst of this expertly crafted black-hearted thriller is a narrative that confusingly drifts people through a slog of inexorable plot machinations. The film follows Russell Core (Jeffrey Wright) as a wolf expert and novelist who is summoned to Alaska by the grieving mother of a child who was eaten by wolves, Medora Slone (Riley Keough). She tells Core that he must kill the wolf before her husband, Vernon Slone (Alexander Skarsgard), returns from deployment overseas. At the heart of these lives is a violence inherent in the struggle between nature and man. They are stranded in some of the harshest environments in the world and lash out against it with coiled violence. The balance in this comes from the empathetic Core who is only forced to true violence when all methods have been thoroughly exhausted. The root of the issue might be that Saulnier isn’t directing from his own script, his log time collaborator, Macon Blair, is the soul screenwriter of the film. While Saulnier’s other two large films, Green Room and Blue Ruin, feature the same hyper-violence, they are rooted in the simplicity of the narrative. Much of the problem with Hold the Dark comes from the over-complication of the plot. This might have worked well in the William Giraldi book, but there simply isn’t enough time to explore the themes within the confines of the runtime. Even at the heart of the film, during one of the most sustained and intricately choreographed shoot outs in recent years, there is a randomness to the scenes that doesn’t fit. The film never effortlessly flows from one moment to the next which is one of the things that keeps Green Room so airtight. The meat of the story is excellent. There is a sparse and unforgiving tale that could’ve been made from this material, but there is no true emotional through line. The script strands a very capable cast in Wright, Keough, Skarsgard, and James Badge Dale, with little material to work with. Wright is working in a similar key to his work on Westworld, however he feels tonally adrift in a movie that can never really find itself. But, even as so much of the movie doesn’t really work, there are moments that Saulnier, in spite of everything else, rings genuine terror out of the set pieces. The central shootout, for example, is worth the padding around it. Even though it doesn’t fully come together, Hold the Dark shows Saulnier expanding his oeuvre with a complete departure from his other work. It is a calling card for the director to work on a bigger, more cohesive canvas.